Dexter Daily: POLL: What Are Your Two Favorite Scenes From the Dexter Season 7 Premiere? 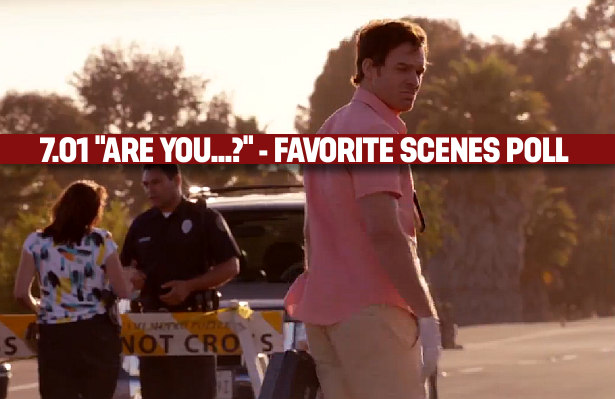 POLL: What Are Your Two Favorite Scenes From the Dexter Season 7 Premiere? It's been almost 5 days since Season 7 premiered. The episode begun with an amazing tease that suggests that Dexter is fleeing the country after being caught in the act of killing Travis by Deb. "Are You...?" was full of great moments, that's why you will have to vote TWO of your favorite scenes-parts instead of one. Pick them in our poll, below! What are your two favorite parts from the Dexter Season 7 Premiere?